A portrait of a youth (unidentified) in barkcloth 'waistcoat'. Manual Catalogues [typewritten, entitled "Zande Photographs (E-P)"] - 122. 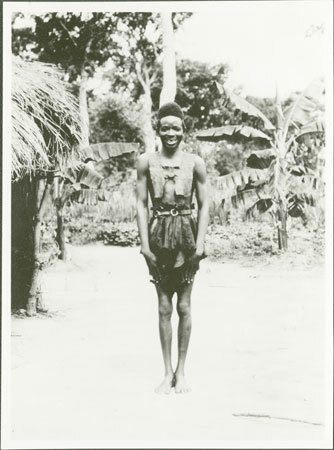 Youth (showing native "waist-coat" made from bark-cloth). 16/4 D.9. Morton, Chris. "Portrait of a Zande youth" Southern Sudan Project (in development). 03 Jan. 2006. Pitt Rivers Museum. <http://southernsudan.prm.ox.ac.uk/details/1998.341.122.2/>.